WASHINGTON — Constructing better training simulators for sailors on surface ships is one of the initiatives being undertaken by the Navy as it implements recommendations made after the deadly USS John S. McCain and USS Fitzgerald collisions, Adm. William Moran, the vice chief of naval operations, said Tuesday. Moran discussed the Navy’s efforts as a result of the 2017 collisions during a maritime security discussion at the Center for Strategic and International Studies, a think tank in Washington, D.C.
Moran, who leads the Navy’s Readiness Reform Oversight Committee that oversees the implementation of 111 recommendations that came out of two reports after the McCain and Fitzgerald collisions, was nominated last week to be the next chief of naval operations, the Navy’s most senior officer. 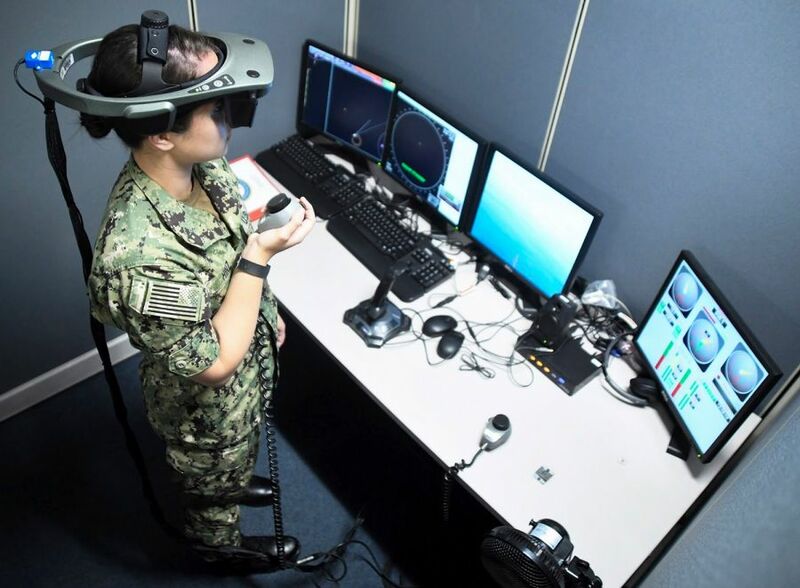 During the discussion, Moran said he was encouraged by the progress of the implementation, and that part of the progress included building better training simulators in the Navy. He was “very disappointed” in the simulators that he saw used by the surface force compared to what he was used to as a naval aviator. The aviation simulators that he used could train pilots under stressful conditions without risking an aircraft, but they did not exist for surface forces in areas where it was needed, Moran said. The Navy has looked at ways to modify and modernize some of the simulators. One of the lessons learned from the 2017 collisions was poor communications and teamwork between the ship’s bridge and the combat information center, Moran said. 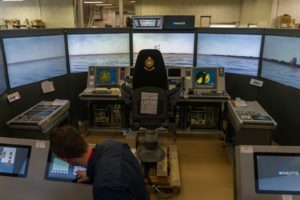 The Navy’s training simulators for ships such as the littoral combat ships are “the best in the business,” Moran said. He wants that type of realistic simulator for every ship class or at least be able to reconfigure one to train a sailor for any ship that they might work aboard. The Navy is constructing new buildings in San Diego, Calif., and Norfolk, Va., with multiple simulators that will allow sailors to undergo more training. “That to me will make the biggest difference over time in terms of proficiency, experience, and the kinds of things that we need,” he said. 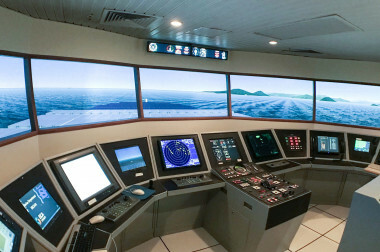 The simulators are not meant to replace experience aboard a ship at sea but to complement it, Moran said. He said he hopes one day to see training simulators aboard ships in shipping containers with capabilities like the “holodeck” in the Star Trek: The Next Generation television series. “That’s probably a vision a little too far but, I tell you, the way things are moving, I’m not so sure,” Moran said. Southampton Solent University is looking to appoint a supplier to design and install a new “maritime simulator suite” in a project worth more than £4m. The contract will also cover the provision of classroom and office space, as well as ongoing support and maintenance over a five-year period. The deal’s likely worth is estimated at between £4.1m and £4.7m. Potential suppliers have until 10 April to submit their bids, with work slated to begin on 7 May. The design and build phases are scheduled to take about nine months. Southampton Solent University’s existing facilities include bridge simulators that feature a 270-degree view and replications of equipment including rudders and thrusters. 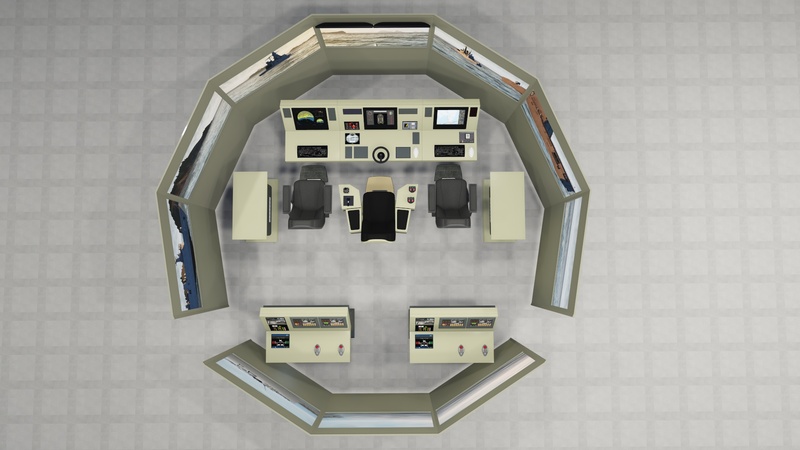 The consoles come loaded with a wide range of ship configurations and geographical databases. 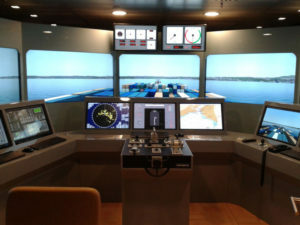 The simulators, which also contain radar technology and an electronic chart display and information system, are located at the Warsash Maritime Academy, which is part of the university. The NAUTIS Full Mission Bridge Simulator jointly developed by VSTEP, Damen Shipyards and Alphatron Marine for the Royal Bahamas Defense Force (RBDF) has successfully passed factory acceptance testing (FAT). The RBDF is acquiring a range of Damen patrol vessels and upgrading its existing fleet. 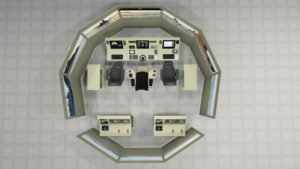 The bridge of the simulator replicates four different Damen vessels, achieved by a changeable steering console with touch screen panels. 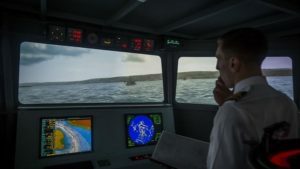 The simulator is based on the latest version 3.0 of NAUTIS featuring graphics, advanced ship dynamics and increased accuracy and visual fidelity of the sea, allowing for the most realistic training possible. With the completion of FAT, the project will now progress to the next phase where the installation of the simulator in the Bahamas will be completed. Final touches will also be made on the virtual environment, which will make the entire Bahamas available in NAUTIS. 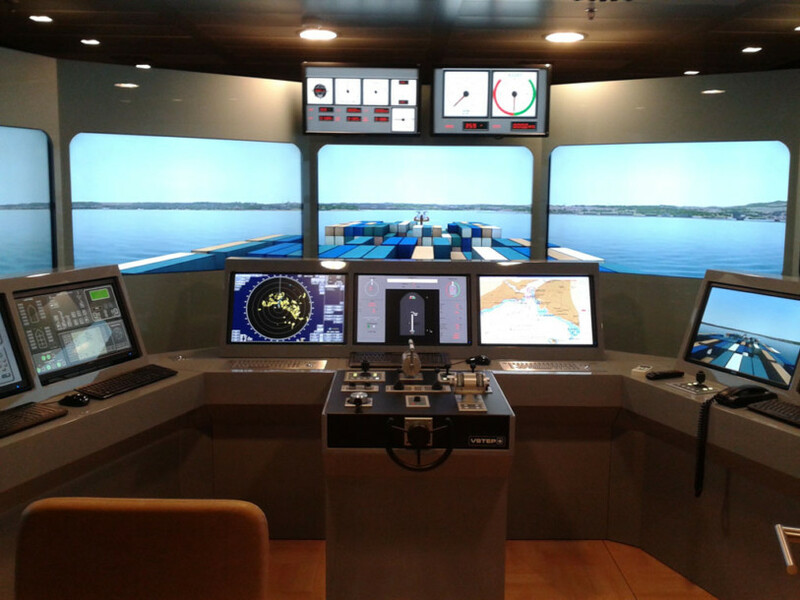 Cosmo Pro AV has created a high-end, 270° edge blending ship bridge simulator, specified by the Hong Kong Marine Department as part of their overall training strategy. In addition to traditional lecture rooms with professional AV teaching equipment, various computer-based simulation environments have also been installed in the training centre. One of the key challenges of this project was to deliver a reliable solution for the blending and automatic calibration of the seven projectors. The Hong Kong Marine Department wanted a truly user-friendly solution that would could easily re-align the projector images without the need for complicated and time consuming maintenance procedures. Cosmo Pro AV decided to employ the latest generation of AV Stumpfl’s media servers running Wings Vioso software, which include Vioso’s multi camera calibration system for maximum efficiency and image accuracy. 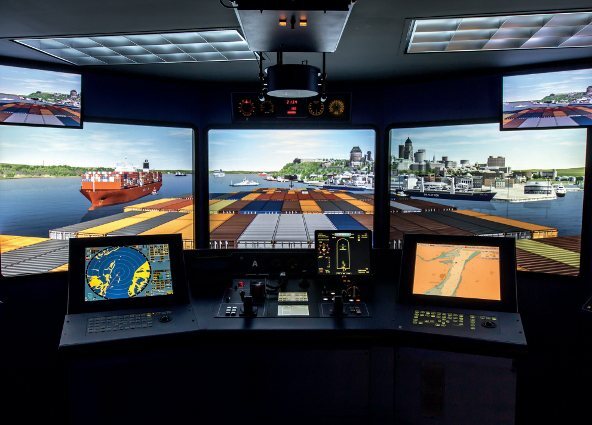 “The limited projection distance meant that the camera positions were critical for the ship simulator project,” explained Jason Yeung, Cosmo Pro AV’s CTO. “Located in the centre of the simulator was the control bridge, which partially obstructed the camera views. Two Wings Engine Stage media servers were used to capture all the image sources from the simulator software, creating one synchronised image. The simulation experience features many scenes that have to realistically portray a variety of real-life scenarios, including the deep black of maritime nights. Seven Barco FL35 projectors were perfectly suited for displaying the visual environments. As the mega ship era continues to unfold, the margin for error when large vessels approach and depart ports is nil. Improvements in port infrastructure, such as the widening and deepening of channels, along with upgrades to piers and cargo handling equipment is necessary for ports to capitalise on new economic opportunities. In addition, the collaboration of humans and technology is necessary to make vessel berthing as safe as possible. 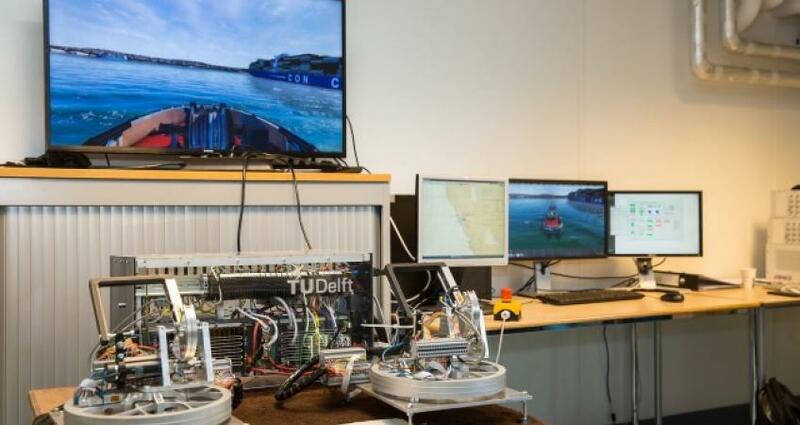 In order to assess if ever-larger ships can safely navigate waterways, both ports and pilot organisations have turned to navigation simulators to verify and validate the most appropriate procedures. However, despite these best practices, pilots are also being challenged by some waterways where port infrastructure has not yet been adapted for the large vessels, so they must adapt as best they can until improvements are made. Vessel sizes have increased exponentially due in part to the new Panama Canal. But even before it opened, the pressure was there for larger ships. In the 70s, we saw large tankers, VLCCs and ULCCs appeared at our sea buoys. Now we see new Panamax and Post-Panamax container vessels, Quantum cruise ships, large gas carriers and capsize bulk carriers requesting berths, tugs and pilots. eMaritime group have written a new five-day Simulator Operators Training Course (SOTC) and will launch it with a free one-off session from June 19-23, 2017 at eMaritime Group HQ, Whiteley, Hampshire. 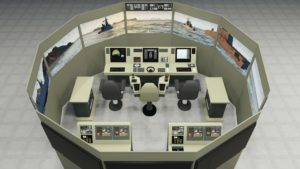 The SOTC course has been written to give those who wish to teach on a maritime simulator the necessary skills, teaching techniques and aids within a standard bridge simulator environment. The course is generic to simulator training in general and so can be applied to any make or model of simulator. The author of the course George Ward, eMaritime Group Project Support, said, "The simulator has become a vital tool for maritime colleges and companies all over the world. But as a company who run two ‘Train the Trainer’ courses, we are only too aware of their complexity which not only can be overwhelming to the instructors, but also they’re not getting the most out of the simulators potential. We’ve written the SOTC course to address these issues, and we would love to invite those who are interested in attending to the inaugural five-day course on Monday, June 19." Damen is an international shipyards group, operating 33 newbuild and repair yards and employing over 9,000 personnel all over the world. Working in all sectors of the maritime industry, Damen delivers 180 new vessels and carries out 1,500 repair and maintenance projects per year. Damen’s success is rooted in its philosophy of standardised shipbuilding, ensuring clients of fast delivery of proven, reliable technology. VSTEP, with input from Damen, will develop four simulated vessels for use in its custom simulator. Pushing the boundaries of maritime simulation, the results of this collaboration will involve the seamless digital recreation of the whole of the Bahamas, an area of 13,878 km2, including nine detailed ports. An official partnership agreement has been signed by SMR Links Consultants and VSTEP, making SMR Links the exclusive partner of the NAUTIS maritime simulators and RescueSim Incident Command Simulator in the UAE region. 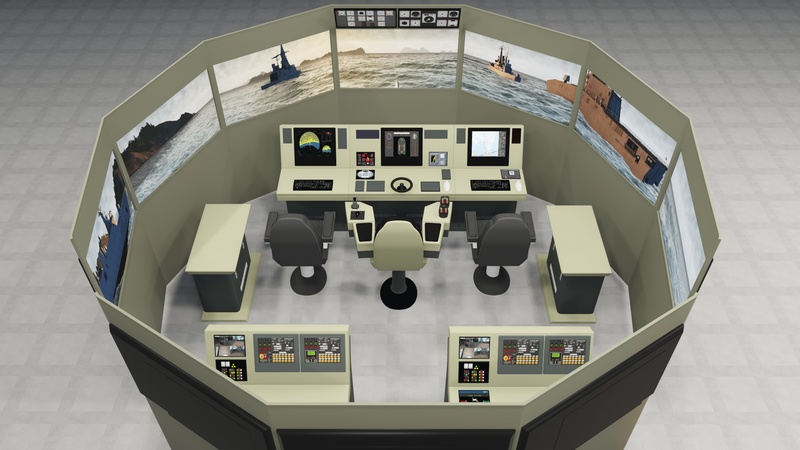 Through SMR Links, VSTEP will be making available its simulator solutions to the UAE market, meeting the needs of the maritime, safety and security sectors, with a focus on education and training, more effectively. Dubai-based SMR Links Consultants specialises in providing technology-driven solutions, including training, simulation and technical support for the marine and military sector as well as onshore and offshore oil and gas fields and facilities services, and management training. Headquartered in Rotterdam, VSTEP is a leading manufacturer of simulators and virtual training software. 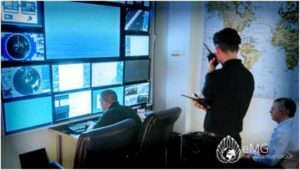 The company has two core product lines- maritime simulator solutions for the civilian and military marine industry (NAUTIS) and incident command and disaster management simulators for first responders (RescueSim).